It inherits that green/white scheme of mine. The navigation menu from the side moved in dropdown lists on the top panel. 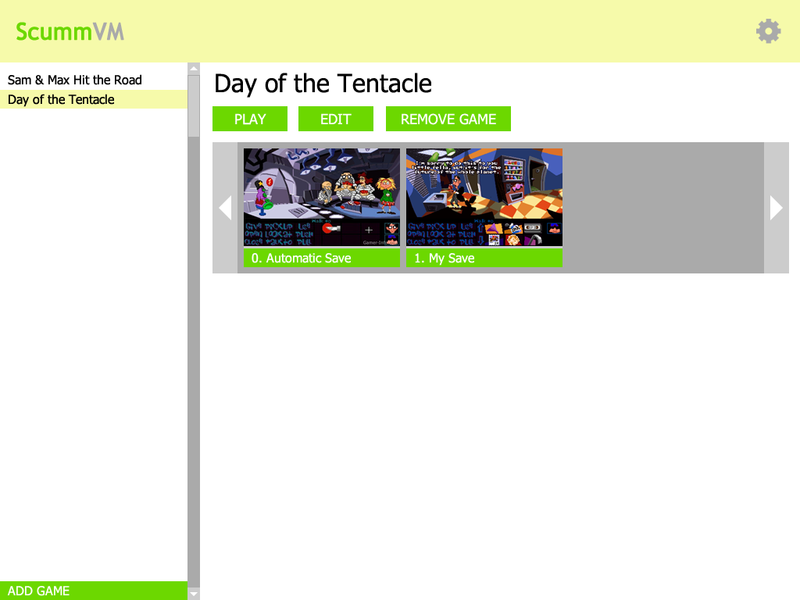 ScummVM description is a bit shorter, shows an actual application screenshot and calls to download the newest version. Then goes the two-column layout, and the right column can contain not only screenshots section, but also Contribute and Donate sections. So, let's try designing a logotype! Step 0. Open an editor. Oh. Probably gradients did all the job. Or the borders. May be try different tones? As you might've noticed, it's a little bit inspired by Steam: games listed on the left and current game displayed on the right. Saves are available right from the very first screen. Options dialog stayed pretty much the same, but tabs are replaced with a list. That allows to add more tabs without any scrolling and makes it look similar to main screen. 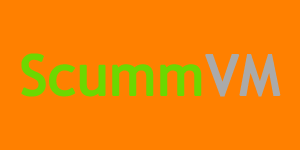 I was unable to add the familiar orange color into this scheme without ruining it, so I replaced it with pale green. The whole look is kind of minimalistic: no gradients, borders, rounded angles and such. 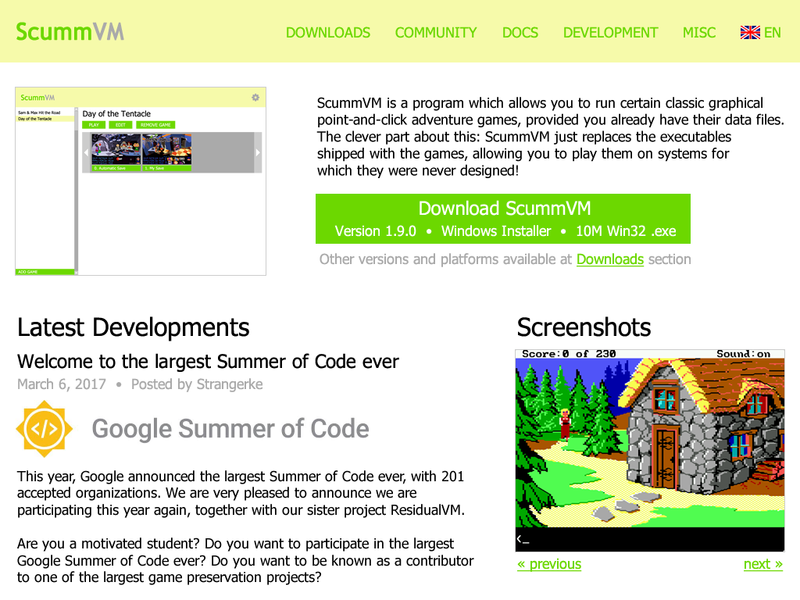 The similar approach could be used to redesign ScummVM site. These sketches show a 1024x768 desktop look, while not doing anything about platforms with smaller resolutions. I think it's OK to go with a simple skin for those, meaning the layout stays the same and only the colors/fonts/images change. I worked with ScummVM GUI system, so AFAIK it wouldn't be too hard to change those layouts to correspond these sketches. That couldn't be achieved with a simple skin, because some minor changes needed to place saves dialog in main dialog or to replace tabs with a list. P.S. It's not about GSoC, but my site is configured to show only those posts which has "GSoC" prefix in the RSS feed Planet is aggregating. What I was working on during GSoC is Cloud storages support in ScummVM. Describing this feature in my proposal (mirror), I mentioned that it would include an API to interact with supported storage providers (which are Dropbox, OneDrive, Google Drive and Box), saves syncing mechanism, functionality to upload and download games data, and, of course, GUI for all of these. Proposal also has some extra tasks mostly making user experience better. Some things were rediscussed during my work, but the main idea remained intact. The work is done and pull request already awaits final review before getting merged. API for all four announced storage providers works fine, saves are syncing and games data could be easily downloaded. Not only described extra tasks were complete, but also some functionality not mentioned in the proposal was added. Saves sync is probably the main reason why Cloud storages support is needed at all. It allows users to easily continue playing the game on another device by simply connecting both to the same storage and doing the sync. It’s automatically started on ScummVM launch, on games saving (including autosaves) and when user opens Save/Load dialog. This dialog was updated to show a progress bar while syncing and also to «lock» slots which are being synced. To indicate that there is a sync in progress, small Cloud icon is shown in the corner. To use the feature, users must connect a storage first. To do so, they should navigate into Cloud tab of Options dialog, select a storage provider and press «Connect» button. It opens a special Storage Connection Wizard, which provides the instructions on connecting. 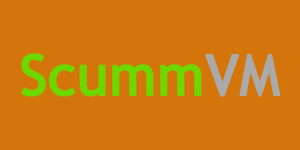 It has different variations depending on set of libraries ScummVM was compiled with. In the most simple case it says users should navigate to a special short link (to scummvm.org), which redirects them to provider’s page. When they allow ScummVM to use their storage on that page, they are redirected back to scummvm.org, where the code is shown. This code should be typed in the wizard dialog. It’s used by ScummVM to connect to the storage and use provider’s REST API then. ScummVM page makes the code that way so wizard could check that code has no mistakes in it. If there is a mistake, it notifies user where it probably is. If ScummVM was built with SDL2, pasting from clipboard is supported. Wizard also has «Open URL» button, which makes it easier to navigate to provider’s page on platforms where URL opening was implemtented (these are Windows, Linux, Mac OS X, Android — iOS and Symbian are coming). But it’s much easier to connect a storage when ScummVM’s built with SDL_net support, because then ScummVM runs a local webserver. In this case users are not redirected to ScummVM site from provider’s page — instead, they navigate directly to webserver’s page. No code typing is needed then, because ScummVM automatically gets it from user browser’s HTTP request. This webserver makes connecting a storage really fast and simple. Another thing Cloud storage might be used for is games data download. Users can put their games into storage and then easily download on all their devices. A special «Download» button in Cloud tab opens Download Dialog, where users can select a remote directory to download and a local directory to download into. It shows a progress bar there and automatically tries to detect a game when download is complete. Users are also free to run download in background: no detection will happen, but a message will appear on the screen to notify them of finished download. Both storage connecting and game downloading are shown in a video I’ve recorded. I’ve also posted information about my progress in the blog every week. Feature is documented on the wiki pages, with some diagrams included. And, finally, we’ve decided that I should do a big extra task. Local webserver, which I originally proposed to simplify storage connecting process only, has been extended to be used for «Wi-Fi Sharing» feature. It means that while ScummVM’s local webserver is running, one can use browser on another device to navigate through directories, download files, create new directories or upload files! Users can specify server’s port and their ’/root/’ directory within the same Cloud tab. Only files under specified directory and ScummVM’s saves directory are available, so users secure data is safe. This week I’ve worked on some security-related updates for LocalWebserver. It now has a «minimal mode» — no Files Manager features are available, only redirect_uri. It’s used automatically in Storage Connection Wizard, and server goes offline the moment it gets the code. Paths are now dealt with more strictly: «../» is forbidden to use, ScummVM has some «blacklisted» directories and user can define where the «/root/» is. Files outside that folder are not available through Files Manager. Plus, if no rootpath specified, «/root/» is not even listed — only «/saves/» is available then. GUI for changing rootpath is added to the same Cloud tab. One other thing I did was rebasing. Travis checks PRs by merging with master and then building. Titanic, which wasn’t there when I started, was using OutSaveFile as if it’s typedefed WriteStream. But in my Cloud PR OutSaveFile is a real class (which starts saves sync when finalized). So, I had to rebase and add a simple fix in Titanic, and now Travis checks are passed again. In order to update WAGE saves, I had to add pos() into WriteStream class. Managed to break a few builds that way. Also, fixed a few crashes in WAGE games. One was because code tried to copy pixels outside of the Surface, and I added checks, so copied rectangle is clipped to always be within surface area. The other was because operator was used on an empty String, and now that code uses it only when String it not empty. Well, this week I was mostly working on some fixes for Cloud PR, some minor warnings, TODOs. Updated GUI a little bit: added a «Paste» button in Storage Connection Dialog, so user’s clipboard could be automatically put in the 8 code fields. 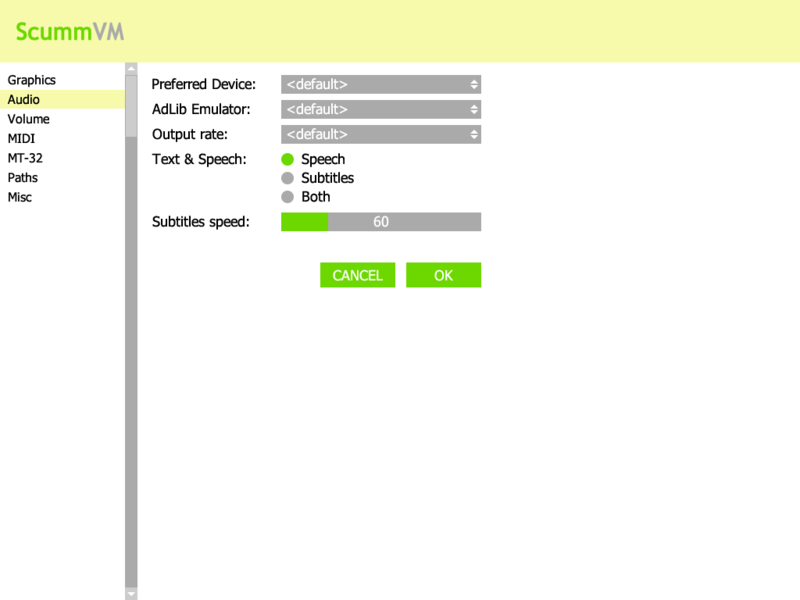 Dialog also contains a Container now, because buttons couldn’t fit in 320×200. Storage providers logos are now shown, which is just a nice thing to have. Apart from that, I’m waiting for PR feedback, and thus have to do something while waiting. 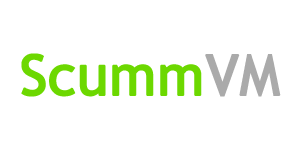 I’ve joined the ScummVM team and now working on WAGE engine. Well, the only thing I did for now was «porting» save/load code from existing Java implementation of WAGE engine into our ScummVM one.